In just a few hours, more than 30,000 runners will cross the start line near the Mandalay Bay Hotel and Casino in the Fifth Annual Las Vegas Rock 'n' Roll Marathon and Half Marathon at 4:30 pm. 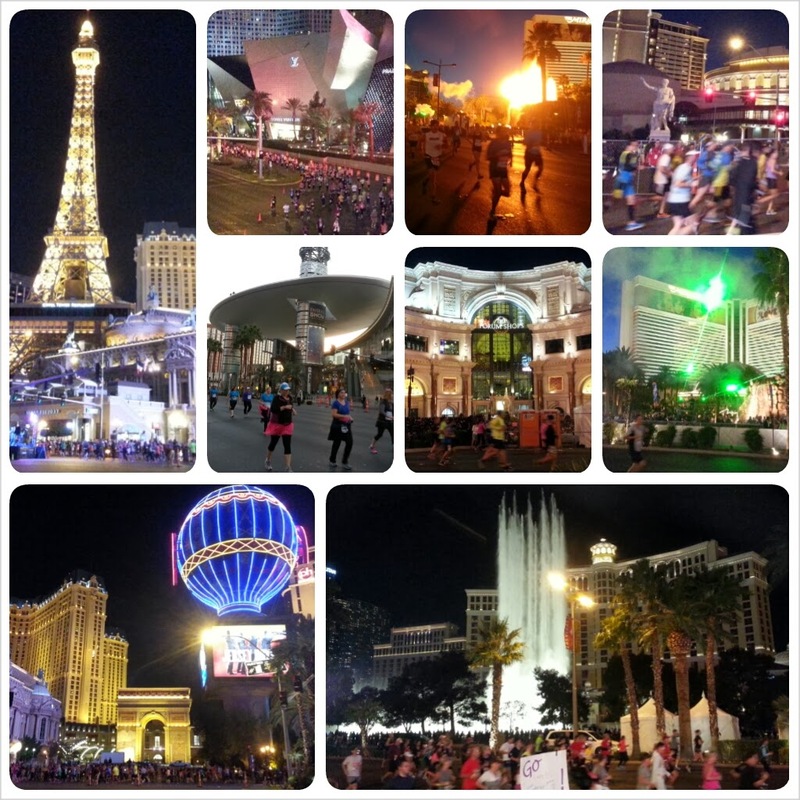 Runners will have a unique experience, passing by faux pyramid and volcano, replicas of the Statue of Liberty and Eiffel Tower, dancing water fountains in front of Bellagio, and Venice-themed canals. The finishing line is in front of the Mirage Hotel and Casino in the middle of the Las Vegas Strip. Another 2,500 runners will run 6.5-mile "half of the half" Marathon, beginning at 3:30 p.m. They will finish at downtown, where following marathoners will pass twice beneath the Fremont Street Experience canopy. The race was pushed up from the first weekend in December in the past races. The postcard to a private swap shows gondolas and an ice skating rink over the canals at the Venetian Casino and Hotel, with the Marathon runners in the background on December 4, 2011. Update: Collage photo from the races today. From left to right and top to bottom: runners pass 1) Eiffel Tower at Paris Las Vegas, 2) Crystals at CityCenter, 3) Volcano at Mirage, 4) Statue of Caesar and Colosseum at Caesars Palace, 5) Fashion Show Mall, 6) Forum Shops, 7) Band stage with laser beams near the finish line, 8) Montgolfier balloon and Arc de Triomphe at Paris Las Vegas, 9) Music Fountains at Bellagio.